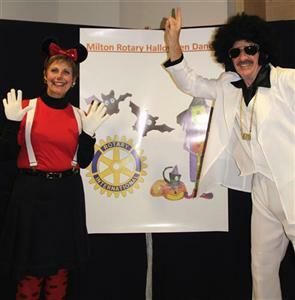 The 2011 Annual Milton Rotary Club Halloween Dance was a huge success with over 80 people attending at the Milton Sports Centre hall and money being collected for the Rotary Horn of Africa Famine Relief Fund. All who attended had a great time and were dressed in their scary best. We look forward to next year's event with equal anticipation. Outstanding live band "Fare Enuff" made their rocking return to one of Milton Rotary's social events on a Saturday night. Playing the best of the 60's, 70's and 80's, the band ushered in Halloween in style. A big thank you to dance committee chair Sohail for all his planning.